DataMine® is UATP’s cutting-edge transaction portal, providing comprehensive insight into Issuer and corporate accounts. With this easy-to-use online tool, subscribers can access up to 36 months of Level III data and effortlessly generate reports customized to specific needs such as dates, city pairs, carriers or travelers. 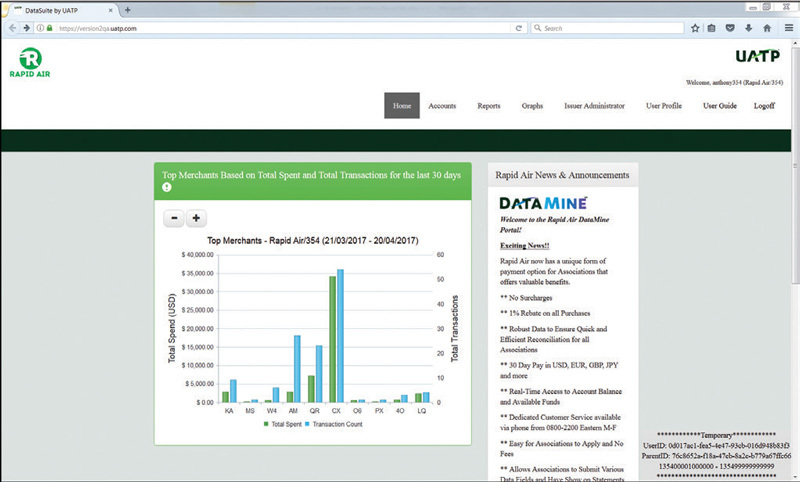 DataMine gives users real-time access to credit limits, balances, and available funds for all UATP account types. To protect sensitive information, administrators can easily add or remove users and edit permissions for existing users as business needs change. DataViewSM is UATP’s digital dashboard that allows Issuers and corporations to pinpoint spikes in transactions and trends best identified in concise charts and graphs. UATP’s advanced toolset also includes the DataStream® advanced billing system used by airline Issuers to bill corporate accounts. The web-based interface allows airlines to effortlessly organize information on a single, centralized tool to streamline management necessities such as setting up accounts, managing credit limits and reporting, making it the single source for billing. A pioneer of single-use payment technology, UATP has long provided tools to allow corporations to set virtual accounts with exact amounts for a specific vendor and/or timeframe. To meet corporate and industry demand for virtual and one-time-use payments, UATP partnered with virtual payment leaders, including WEX to allow corporate account holders to pay for hotels through PAXVIA, the WEX Virtual Credit Card Solution (VCC). Corporate account holders can pay for hotels through virtual account solutions and receive one consolidated travel statement for all air, hotel, rail and TMC charges. Reduced fraud is one of the benefits of such virtual offerings and UATP reports one of the industry’s lowest rates of fraud. To add value to the Network, UATP partners with new processing platforms that diversify UATP’s payment acceptance and channels for airfare payment around the globe. And, to make it even easier for Issuers to accept payments from AFPs through its Network, UATP recently introduced CeptorSM as a single link to more than 200 of the AFPs currently operating around the globe. No matter how you want to pay, UATP is building the backbone to facilitate AFPs. With UATP, there is never an application, annual or foreign exchange fee.